In September 2015, Craig donated $47,000 to the presidential campaign of Bernie Sanders. ↑ "GRO Birth Registration Index". Ancestry.co.uk. Retrieved 17 February 2009. ↑ Thompson, Jody (25 June 2011). 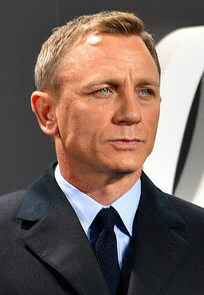 "The name's Craig, Mrs Craig: Rachel Weisz 'secretly marries James Bond star Daniel Craig in undercover ceremony'". The Daily Mail. UK: Associated Newspapers. Retrieved 26 June 2011. ↑ Fulton, Rick (7 November 2006). "Royale Family". Daily Record. Retrieved 9 November 2006. ↑ "Academy Invites 115 to Become Members". Press release. 18 June 2007. Archived from the original on 24 December 2007. https://web.archive.org/web/20071224094334/http://www.oscars.org/press/pressreleases/2007/07.06.18.html. ↑ Richardson, Bradford (September 10, 2015). "Bond actor donates $47,000 to Sanders PAC". The Hill. This page was last changed on 21 August 2018, at 08:52.